Economical 10 x 6 plastic register for walls or ceilings in damp areas. This Register comes in a white finish and has a 3-way deflection. Overall dimensions are 12 7/16" x 8 7/16". ***PLEASE NOTE: These items have been discontinued and have a limited stock available. Our 10 x 8 plastic wall register are great in damp areas. The plastic body on this register prevents any rust and this register has a 3-way deflection. Great for walls and ceilings. Plastic decorative baseboard cover in a 10 inch x 6 inch size. These no-rust baseboard returns featuring an attractive Victorian design. The baseboard return grill depth from the wall is 5/8 inch. Faceplate dimensions are 12 x 8 inches. Simple to install and easy to use our 12 x 6 white plastic register is great for wall and ceiling use. No metal in this wall registers which will prevent any rust. The overall faceplate of this register is 14 7/16" x 8 7/16". Plastic decorative baseboard cover in a 12 inch x 6 inch size. These no-rust baseboard returns featuring an attractive Victorian design. The baseboard return grill depth from the wall is 3/4 inch. Faceplate dimensions are 14 x 8 inches. Plastic decorative baseboard cover in a 14 inch x 6 inch size. These no-rust baseboard returns featuring an attractive Victorian design. The baseboard return grill depth from the wall is 3/4 inch. Faceplate dimensions are 16 x 8 inches. 2 x 12 contemporary plastic floor registers are rust proof and dishwasher safe. Installation couldn't be easier; simply drop into the ductwork. This quality crafted plastic register with a polished brass finish, has an elegant look. Featuring all plastic construction that is both rust proof and dishwasher safe. 2 x 12 satin nickel finish plastic floor registers are made of a high quality ABS resin. Plastic floor registers are anti corrosive and even dishwasher safe. 2 x 12 plastic Victorian floor registers have a brushed nickel finish. Decorative vents have a fully operational damper that allows for air flow control. Rustproof and dishwasher safe. Plastic decorative baseboard cover in a 30 inch x 6 inch size. These no-rust baseboard returns featuring an attractive Victorian design. The baseboard return grill depth from the wall is 3/4 inch. Faceplate dimensions are 32 x 8 inches. 3x10 Plastic Contemporary Brown Register. These Registers are your perfect solution for high moisture areas. They now come with an easy to use sliding damper. 3x10 Plastic Contemporary White Register. These Registers are your perfect solution for high moisture areas. They now come with an easy to use sliding damper. 4x10 Plastic Contemporary Brown Register. These Registers are your perfect solution for high moisture areas. They now come with an easy to use sliding damper. 4x10 Plastic Contemporary White Register. These Registers are your perfect solution for high moisture areas. They now come with an easy to use sliding damper. 4 x 10 plastic floor registers are scratch resistant and rustproof. These high quality plastic registers are stronger than they look and can hold at least 300 lbs. Antique brass finish is a classic look. This 4 x 10 plastic floor register has the look and warmth of real oak. This register is capable of holding more than 300 lbs and has a fully operational damper. Plastic floor registers are designed to look like real polished brass floor vents. These air vents are rust proof and you can even wash them in the dishwasher. Designed to hold 300 lbs. 4 x 10 plastic floor registers are rated to hold more than 300 lbs. This register features a fully adjustable damper for maximum air flow control. Rustproof and dishwasher safe. 4 x 10 Plastic Victorian Satin Nickel Register. Dishwasher safe, corrosion-resistant registers, capable of holding at least 300 lbs. Made of heavy duty ABS resin that will never rust or corrode. 4x12 Plastic Contemporary Brown Register. These Registers are your perfect solution for high moisture areas. 4x12 Plastic Contemporary White Register. These Registers are your perfect solution for high moisture areas. They now come with an easy to use sliding damper. 4 x 12 contemporary plastic floor registers have an antique brass finish. Contemporary vent covers are rust proof and dishwasher safe. All plastic construction including the operational damper. Imitation wood finish registers offer the look and warmth of wood but will never warp or corrode. Plastic floor registers have an adjustable damper and are dishwasher safe. Plastic floor registers have a polished brass finish without the maintenance of tarnish concerns. Made of a high quality resin these vents will hold more than 300 lbs. Dishwasher safe and corrosion resistant. 4 x 12 plastic registers are designed with clean contemporary lines. Constructed of durable ABS resin, registers are moisture proof and even dishwasher safe. Features a functional damper. Victorian style registers have a satin nickel finish. They are constructed of durable ABS resin, for durability. These registers are anti-corrosive and won't rust. 4 x 14 plastic floor registers will not rust and are dishwasher safe for easy maintenance. This contemporary air vent is all plastic construction including the functional damper. Featuring an antique brass finish. These beautiful polished brass finished plastic floor registers have the look of real brass without the maintenance. These are constructed of heavy duty resin and can support more than 300 lbs. 4 x 14 Contemporary plastic floor registers are crafted from sturdy ABS resin. These decorative heating vents feature a fully operational damper to control air flow. Brushed nickel Victorian floor registers are sturdy enough to support over 300 lbs. These are rust proof and even dishwasher safe. They have a built in adjustable damper. This traditional white register is made from 100% high density plastic and will not rust. With two-way deflection, our 6 x 10 plastic wall vent is great to use for heating or cooling needs. Plastic white vents are 100% rust proof. Use this 6 x 12 register on the wall or ceiling by installing with mounting screws. This bi-directional wall register cover is made from all plastic, damper included. Perfect to use in your bathroom or kitchen since it will not rust. Lightweight and waterproof this 8 x 4 plastic wall register is great for damp areas. This plastic register can be used on wall or ceiling and has a single deflection. Outside dimensions are 10" x 6". 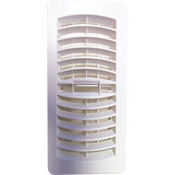 12 x 6 rustproof plastic return air vent cover in an attractive scroll design. This decorative return air grille is sold in white, but they can be easily painted to match you decor. Faceplate dimensions are 14 x 8 inches. 2 x 12 plastic are vents feature an adjustable damper. No tools required for installation, simply drop into place. Non corrosive and rust proof. 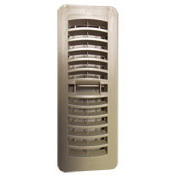 14 x 6 rustproof plastic return air vent cover in an attractive scroll design. This decorative return air grille is sold in white, but they can be easily painted to match you decor. Faceplate dimensions are 16 x 8 inches.